Custom lawn signs can transform your business from ordinary to extraordinary. Our custom built lawn signs are quite elegant and attractive and will fit in perfectly with any landscape. It offers your clientele an afore taste of the exceptional services that your business offers. With our custom made signs, your company’s image is sure to have its presence strongly felt in the marketplace. Even at a glance Turf Signs’ eye catching signs ensure that the pertinent and necessary information about your business is conspicuously displayed. Why do you absolutely need to use our signs to advertise? We offer the most affordable and attractive advertising packages in the industry. Our custom lawn signs are made from chloroplast which allows them to tenaciously withstand the oftentimes harsh elements of the weather. Using our signs ensure that your business maintains a dominantly vivid presence especially within its locality as it allows you the benefit of having your customized lawn signs viewed by a significant number of pedestrians and motorists alike. They serve as permanent reminders to existing clients as well as attract new ones. 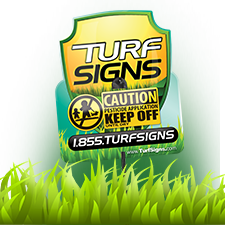 Experience, why more and more people are opting to have Turf Signs design and create lawn signs. Our creative and expert team is always coming up with intuitive ideas that will fit your business’ advertising needs. We understand that, as an unique individual, you have specific tastes and that is why, your valuable input is never exempted in creating a masterpiece sign that satisfies your distinctive pallet. That is just another one of the many reasons to choose Turf Signs for your advertising needs. We can have your sign ready within two weeks. Our custom lawn sign is great for displaying on any lawn, whether commercial or residential properties. Turf Signs gives you more leverage as spending less and earning more is finally possible with our affordable marketing packages. Passersby will be sure to notice these hard-to-ignore, appealingly designed signs that consistently reminds them of your company’s name, web address, phone number and special offers. We want to help you in ensuring that your business stands a cut above your competitors, so visit us today at www.turfsigns.com or call us at (855) 887-3744 or (813) 444-4441.